Did you know that the Chicago River flows out of Lake Michigan, not into it. But it used to. Flow into Lake Michigan that is. They changed it in the late 1800s. Why? Chicagoans were dumping their toxic waste into the river but drawing their drinking water out of Lake Michigan. Even an Ohio State grad could deduce that wasn’t smart. So they dug a canal and emptied the Chicago River into, ultimately, the Mississippi. Because they don’t drink out of that river. Pretty cool, huh? Somebody asked me recently about river rights in Georgia. If you “own” property on the river, can you control the river access? Surely not, you think. But let’s say that you own both sides of the river. Can you keep the river to yourself? Maybe. If you own both sides of a non-navigable river, you have exclusive control of that stream, (OCGA 44-8-5) although there are flow restrictions (OCGA 12-5-31). If it is a navigable stream or river, meaning boats can traverse it with cargo, then you only “own” to the low water mark on the bank (OCGA 44-8-2). So let’s say you are tubing down the river, but you need to take a leak on some dude’s yard. Now that you know he owns the river bank, if you’ve gotta go, just sink into the river a bit and let it flow. Unlike Uncle Ted’s pool, there isn’t that magical dye that is going to turn the water blue so everyone knows you are the culprit. What about the air over your house? Do you own it? This comes up because of drones. A dude in Kentucky saw a drone hovering over his yard, maybe spying on his teenage daughter who was sunbathing. So he shot it down. And then the police arrested him. It’s a crazy story for another day, but if you see a drone hovering over your back porch, can you shoot it down? Are you 50 yards away from a public road, required under OCGA 16-11-103? Oh yeah, lots of cities forbid shooting except for self defense. 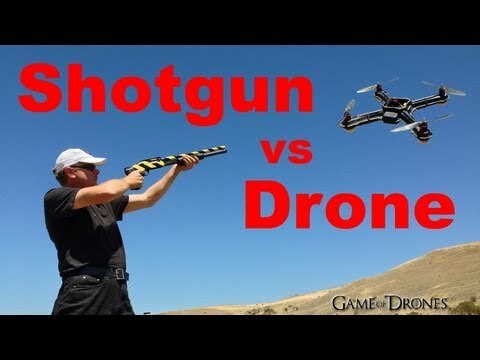 Let’s assume the drone isn’t armed, can you shoot it? We have no statute on the books specifically for this situation, so we have to use other statutes as guidance. If someone is trespassing on your property (OCGA 16-7-21), can you shoot them? Generally no, if that is all they are doing (OCGA 16-3-21, et seq.). Most sensible people concur with that. But that is human life, this is a drone. Let’s say somebody parks in your driveway while attending a neighbor’s party. Can you destroy their car (OCGA 16-7-23)? Generally no, if that is all the facts we have. Again, most people concur with that. It’s looking like you can’t shoot down the drone, isn’t it? Let’s say that instead of shooting it, you knock the sucker down with a well placed football throw. You had no intent to damage it, just disable it. Owner comes looking for it. You mention that you and your son were throwing the football around and, lo and behold, the drone swooped in and got hit. Sorry about that. Oh, and why were you flying the drone in my backyard anyway? That at least starts the discussion that hopefully doesn’t end in your arrest (OCGA 17-4-20). You know, shooting it down and burying the evidence is probably easier. Give yourself 8 points on your law knowledge, we covered a lot today. Previous Blood In The Streets? Not Exactly. HB60 Changed Little, Except Rights.